Loads of apple inspiration from some of my favorite bloggers. You'll find every kind of recipe, from drinks to desserts and breakfast, lunch and dinner! What a great week of apple recipes! Are you sick of apples now? Me either! And if you said yes (for shame!) don't worry, it'll be at least a day or two before I bring them up again. To make it even better, I have a super fun chocolate treat coming your way tomorrow. That should help, right? In the meantime, we're devoting one more day to all things apple. They are just so versatile and delicious. Plus I've never met anyone who listed apples on their list of most despised foods. Mine is olives if you are curious. No thank you! It's olives and nuts for my husband. Little Dude is still deciding! But we all like apples, and applesauce... and cider too. Oh heck, pies and crisps and cobblers and salads and anything apple! So my friends with Celebrate365 and I wanted to spend one more day on the subject before we move on. Of course if there isn't enough apple inspiration here, you can check out all of the appleweek goodness here and there is still a few days left to enter to win prizes! If you are a blogger, drop your favorite apple posts below. We round up our favorites in a separate post and pin them all! 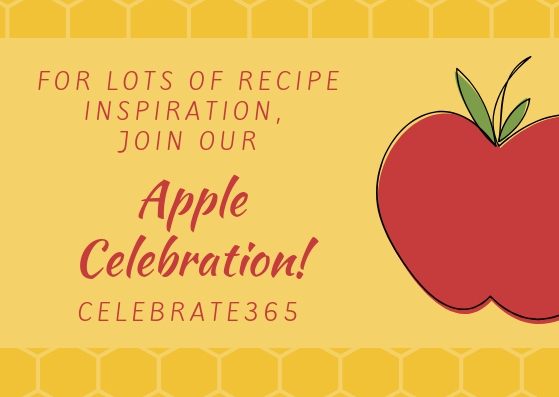 If you aren't a blogger, I'd love to hear about your favorite apple recipes in the comments. Be sure to check out some of the delicious recipes below too! Thanks for hosting this Link-Up Carlee! Thanks Carlee, for the invitation. I also posted some older recipes. Hope that's okay. Of course! I love going back and seeing old favorites! Apples, Yes! Olives, NO... lol!! I've loved all the appliciousness you've been sharing!